I popped on for a quick little computer break tonight, and I'm excited to share that my Abby's Owl Quilt Pattern is featured in the Quilt Market Trend Report at the Quiltwoman Blog! How cool is that! The Abby's Owl pattern also includes a bonus pattern for the coordinating bed quilt pictured above, you can find the pattern at Quiltwoman, or here on my website. ...And my Minneapolis Tote is also on the Quiltwoman blog post a little further down the page! This weekend I took another trip with the Baltimore Applique Society to visit Winterthur in Delaware. It was a great day! While there we got a behind the scenes peak with curator Linda Eaton who got out several Baltimore Album quilts in the Winterthur collection that are not currently on display. We were not allowed to take pictures of these rare quilts, but photos were allowed on the Yuletide house tour, and I endulged completely. There were little festive Christmas touches all over the house that just took my breath away. And of course there were trees...all over the house. They were just stunning in person. This one was covered with live peonys with little glass vases of water to keep them fresh. Winterthur is known for it's peony gardens in the Spring. You can visit Winterthur for the Yuletide tour through January 9, 2011. If you can't visit, there are more Yuletide pictures in a slideshow here at the Winterthur website. ...I'm thankful that this pile of 72 album blocks, is finally a quilt top! This is another huge quilt top at approx 90" x 101" ~ I've been making a lot of big ones lately! There was an excessive amount of piecing in it too...and with not a bit of applique which was really strange for me. Each of the 72 blocks has 27 pieces, plus 161 sashing rectangles, plus 90 sashing squares = 2195 pieces! Now I can take a little break from the sewing machine and start baking and getting the house ready for the family coming for the holiday weekend, and I'm thankful for that too! Have a wonderful and safe Thanksgiving weekend and Enjoy the day! ﻿This one was an example of the trend seen in the end of the 1800s to make quilts of many tiny scraps. These pinwheels are small, and then it's topped off with that cute pieced border! I love the border on this beauty. I didn't catch the date on it, but it's really my style, I always gravitate to this kind of Red/Green block type. 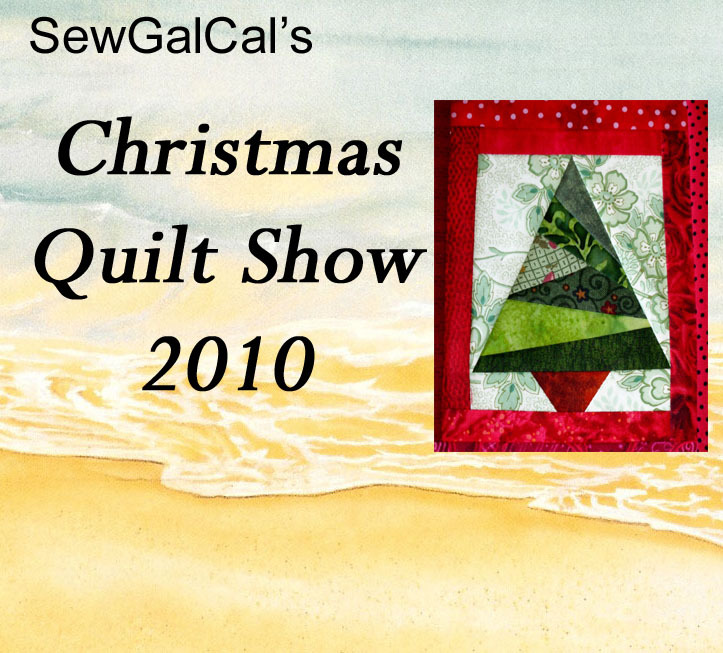 There's a Christmas Quilt Show going on in blog land, so of course I wanted to jump in on the fun! This is my Winterberry Wreaths quilt that appeared in Quilt Almanac Magazine this past year. 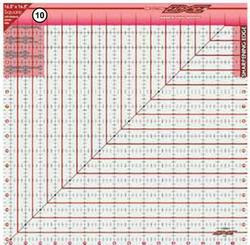 **And Quiltwoman is having a Holiday Special of free shipping on retail orders of $20 & over through November 18th! Maria Ohaver machine quilted this quilt for me with these fun reindeer and holly motifs all over (you can see them better in the photo on the back of the quilt). And just for fun I made a coordinating throw pillow that is also included as a little extra bonus in the pattern. If you want to get in the Christmas Spirit and see some fabulous Holiday quilts on other blogs, pour a cup of tea, get comfortable, and hop on over to SewCalGal's blog for the links to this wonderful online Quilt Show. I like old things...Don't get me wrong, I like to buy nice new things too, but there's just something about an old piece of furniture that makes me feel good. This piece was un-earthed from my father-in-law's garage after he had passed away a few years ago. It's a record cabinet, and belonged to my husband's grandmother, who as he remembers, kept old 78 rpm records in it. It was in pretty bad shape covered with scratches and paint splatters, and almost went to the dump. But I kept looking at it, and when no one else wanted it, I decided it would come home with me. First I gave it a through cleaning to get rid of everything that was growing on it and living in it, and then I put it in my basement to maybe refinish one day. Well the more I looked at it, I decided I kind of like the scratches that were from the everyday use of Grandma Stewart and her kids, and the little paint splatters that I'm sure are from my father-in-law working on and around it in his workshop ~ which he loved to do. So the other day, after it sitting in my basement for the last five years, I had my son carry it up to my sewing wing. I did a little re-arranging, and now it sits in a place of honor right next to my cutting table with a new use. All of the ladies on the Quilt Retreat last weekend worked on a lot of different projects and got many more finished than I was able to snap pictures of, but here is a sampling of some of the other progress that was made on our little weekend away. 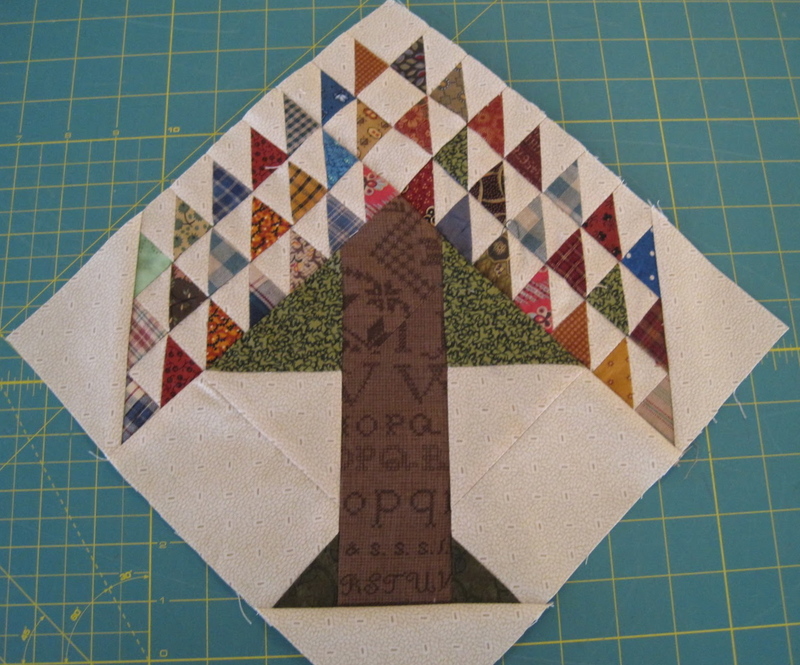 My friend Mary of Keep Me In Quilts made this little Tree of Life block from left over half square triangles from another project. Mary is the queen of making something great out of nothing! She even had to size down the pattern to accommodate her smaller hst snipets. Along with many other projects, Mary has been playing with wool a lot lately, and finished this cute little wool sheep top on the retreat. Teresa, among other things made about ten of these beautiful Christmas stockings that she makes out of upholstery fabrics. I love how she trims them out. She also worked on a bunch of hand pieced and embellished wool ornaments. Tara whipped up these happy and bright placemats and table runner. Well I've been doing some unpacking ~ and a lot of laundry today, so here it is...my production from the weekend's Quilting Retreat. Along with blanket stitching some things off of my huge "Blanket Stitching Pile" (I'll show you those later once they are quilted), I string pieced some Christmas Stockings. These two are for Elsie and Abby, and I have more of the same style available in my etsy shop. And I made this little tree stocking just for fun. I love prairie points, so I wanted to see if I could use them along the top. 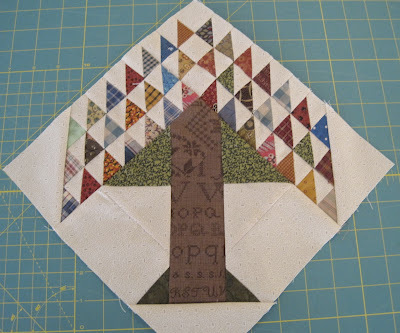 On this one, I just string pieced the tree and appliqued it on with a blanket stitch. I had this Thimbleberries table runner pieced already (I actually made the top several years ago), but I got it quilted and bound this weekend. It's going to be another Christmas gift :) Let me tell you, it feels so good to see some old time UFOs coming to completion! And I finally got the binding on my Jo Morton Somerset quilt. I had pieced it a Jo Morton Club or two ago, and Sheri Thompson had quilted beautiful feathers all over it for me, and I finally used this weekend to make and apply the binding. Now it's all finished and I've been curling up and enjoying it as a perfect little lap quilt. This one is for me! I even made myself make a quickie label and put that on while I was on the Retreat, because I knew I wouldn't do it once I got home. We had a blast, staying at the Blue Mountain Retreat Center in Knoxville MD right outside of Harper's Ferry WV. The weather was beautiful, and made for the perfect scenery to quilt by :) It was awesome the amount of stuff we were all able to get finished. Tomorrow I'll show and tell a few of the beautiful things that the other ladies made while we were there. Show and Tell & A Winner! Just popping in with a quick show and tell ~ While traveling to and from Quilt Market last week, I was able to get some knitting done in the airports and planes. Here is a pair of socks that I got finished (well I did have one of them done before the trip). One more Christmas gift checked off the list! Some Market Favorites and a Give Away! While zipping around the vendor floor at Quilt Market, I always like to look for some new favorite products. Of course I ran around and checked out all of the new fabric lines (lots more coming out in retro brights and more oil cloth), oogled over the beautiful sewing tables/furniture, buzzed by the Handiquilter booth as saw their new upgraded sit down machine that is really tempting me, and had to stop by and see the new Go Baby that Accuquilt is coming out with (that cute little pink carry bag is adorable by the way). But it's funny, this year I was attracted to many items that I already have! 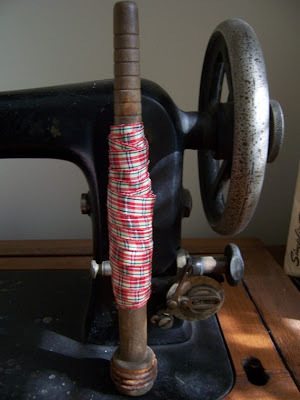 I always love stopping by the vendors that carry the vintage ribbons/trims and buttons ~ and this year I didn't really have much time to shop them, but I spotted lots of the ribbons wound around antique spools much like the ones I have available for sale in my etsy shop or on my website. 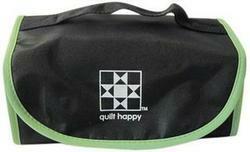 The Quilt Happy people had a booth at Market, and I got to see all of their product line up close and personal. They have some really nice totes and things coming out in the new year. I just love my little carry all, and already have them available here in my shop﻿. ...And in keeping with our little tradition of a Market Goodie Give Away, here is a little pile of things that I've brought home just to pass on the Quilt Market love. Included in the give away is a great oversized tote from the Go Baby Schoolhouse that I attended, a really cute little gift box that has a special Go Baby key chain along with a bubble gum cigar to annouce the birth of the Go Baby :), A fabric tote bag from Andover made with their Dimples line, a current issue of Quiltmaker Magazine, A card making kit from eStudio fabrics and Christine Adolph, and a cloth quilt label...and I just may throw a few more things in the box before I ship it out to a lucky winner. Schoolhouse, the day before Quilt Market opens, is a program that offers one session after another all day long where you get to see the new and exciting things coming out in the quilt world. First I had the dilemma of choosing what sessions to attend and what to pass on. Some sessions are purely educational, and not full of glitz and glamor. I attended several web/marketing education classes ~ which is what I needed to be doing ~ but they weren't exciting enough to take pictures in that's for sure. But I did get to attend some sessions that were hosted by some of my favorites in the Quilt World. I was so happy to see Elly Sienkiewicz and the beautiful quilt that she was showcasing from her book, Beloved Baltimore Album Quilts. There is also a wonderful exhibit of Baltimore Album quilts at Market/Festival this year that is a must see if you're there, but pictures aren't allowed for most of it. There is a new program that was kicked off at Market in conjunction with Quilts of Valor called Under Our Wings. Marianne Fons hosted along with Catherine Roberts, the founder and Executive Director of Quilts of Valor. 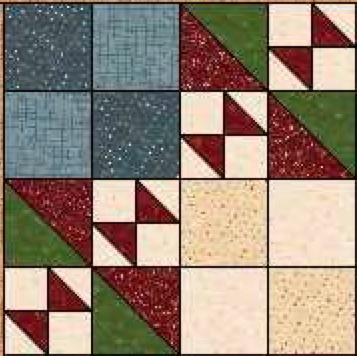 The ladies introduced the new program that is bringing 9 different fabric companies under one tent to work together to release special Quilts of Valor fabric lines for making patriotic quilts for those military members who have been touched by war. The Under Our Wings program is an incentive to pair up a mentor with a non-quilter to make a quilt to give. It looks exciting ~ be watching for the QOV fabric lines coming out in the Spring from Andover, Clothworks, Marcus Fabrics, Moda, P&B, Quilting Treasures, Red Rooster, Timeless Treasures, and Windham. I of course went to the Accuquilt Go Baby presentation and enjoyed Ricky Tims and Alex Anderson have a little fun, in that sweet Ricky and Alex style. And of course I couldn't miss the Jo Morton Schoolhouse session :) This is a picture of Jo with a quilt made from her design Cut the Mustard, that a lady made using the Annandale fabric collection. It was stunning! These are sneak peeks at some of the projects coming up in the Jo Little Women's club 10. The next club will be run a little differently than in the past. I don't have details yet, but basically there will be 8 projects that will span the course of a year instead of 6 months. Picture quality took a back seat to just trying to snap a shot as a quilt passed by, and many of my pictures were filled with people's heads and deemed not blog-worthy (and remember, I'm still learning this new camera and it's idiosyncrasies), but this gives a little sampling of what goes on at Schoolhouse.